Secondary hyperparathyroidism (SHPT) is a common complication of chronic kidney disease (CKD) that is associated with increased mortality (1–3). Hyperphosphatemia, hypocalcemia, and a progressive decline in calcitriol levels all stimulate parathyroid hormone (PTH) secretion and have long been known to contribute to the pathogenesis of SHPT (4,5). Importantly, hyperphosphatemia and hypocalcemia typically occur only with advanced CKD, whereas calcitriol deficiency is an earlier phenomenon, leading some authors to suggest that calcitriol deficiency may be the primary initiating mechanism of SHPT (6). Traditionally, the progressive reduction in calcitriol levels has been attributed to insufficient renal 1α-hydroxylase activity as a result of the concomitant decline in renal mass along with a functional inhibition of the enzyme by hyperphosphatemia (7). However, although these factors likely play an important role in advanced CKD, the observation that calcitriol levels begin to decline long before the development of hyperphosphatemia (4,8) suggests that additional pathophysiologic mechanisms likely contribute. Excessive circulating levels of fibroblast growth factor-23 (FGF-23) underlie the renal phosphate wasting and inappropriately low levels of calcitriol that characterize tumor-induced osteomalacia (TIO) (9,10). X-linked hypophosphatemia (XLH) is often associated with elevated FGF-23 concentrations, and even more pronounced and consistent FGF-23 elevations are observed in the Hyp mouse, the rodent model of human XLH (9,10). Furthermore, FGF-23 mutations that render the protein resistant to proteolytic cleavage are the cause of autosomal dominant hypophosphatemic rickets (ADHR) (11). Animal and preliminary human studies suggest that FGF-23 may also be involved in normal phosphate and vitamin D homeostasis (12,13). Increased FGF-23 in response to phosphate loading induces phosphaturia and inhibits renal 1α-hydroxylase (14,15), thereby maintaining the serum phosphate in the normal range. In CKD, in which there may be end-organ resistance to the phosphaturic stimulus of FGF-23, higher levels of FGF-23 may be required. Indeed, patients with ESRD demonstrate markedly elevated levels (16,17). A potential adverse consequence of upregulated FGF-23 in early-stage CKD, however, might be accentuated inhibition of renal 1α-hydroxylase, resulting in early calcitriol deficiency and, thus, potentially initiating the development of SHPT. 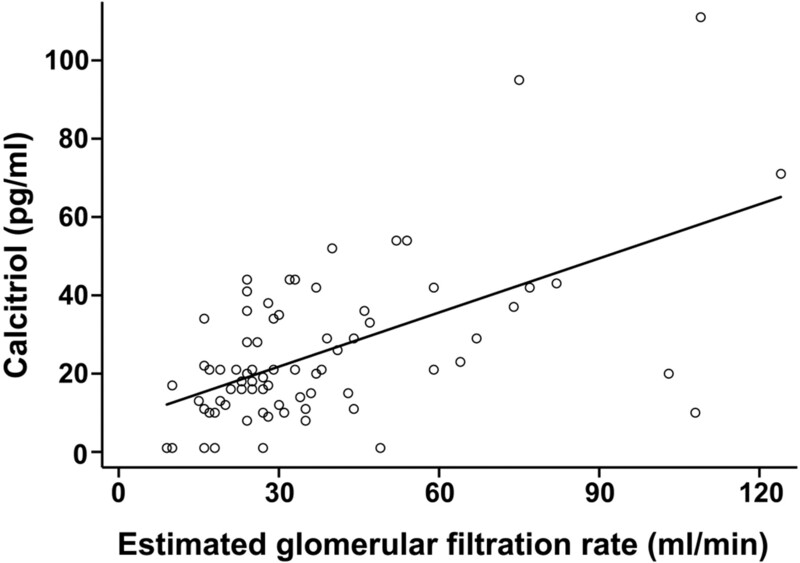 In a previous study of CKD patients, FGF-23 levels were linearly correlated with serum phosphate, urinary phosphate excretion, and PTH and inversely correlated with calcitriol levels (18). However, that study included only patients with chronic glomerulonephritis, most of whom had mild CKD, and the authors did not consistently adjust for potential confounding factors. Specifically, in the analysis of the association between FGF-23 and calcitriol levels, they did not adjust for 25(OH)D3 levels, the storage form of vitamin D that serves as the substrate for renal 1α-hydroxylase and that is often depleted among CKD patients (19). Furthermore, in their analysis of the association between FGF-23 and renal phosphate excretion, the authors did not adjust for PTH, itself a potent phosphaturic hormone. Therefore, we performed this cross-sectional study of patients from across the entire spectrum of predialysis CKD to test the following hypotheses: (1) FGF-23 levels increase with advancing stages of CKD; (2) the rise in FGF-23 levels and the reduction in calcitriol levels precede the development of hyperphosphatemia; (3) increased FGF-23 levels are associated with increased urinary phosphate wasting independent of PTH; and (4) increased FGF-23 is associated with reduced calcitriol levels independent of serum phosphate, 25(OH)D3 stores, and renal function. Consecutive patients were recruited from the outpatient nephrology clinic at the Massachusetts General Hospital (MGH). The renal clinic at MGH offers consultative services for a diverse patient population through referral sources from practices within the main campus, surrounding neighborhood health clinics that primarily serve indigent populations, and local private practices. Patients were eligible for our study when they were 18 yr of age or older and had a history of CKD, as defined by either an estimated GFR (eGFR) <60 ml/min per 1.73 m2 for ≥3 mo or evidence of kidney damage (i.e., persistent proteinuria or hematuria) for ≥3 mo despite a normal eGFR (20). Patients were excluded when they had a known history of any phosphate wasting disorder (e.g., TIO, XLH, ADHR, untreated primary hyperparathyroidism), were currently treated with renal replacement therapy (hemodialysis, peritoneal dialysis, or kidney transplant), or were being treated with activated forms of vitamin D (calcitriol or doxercalciferol). In addition, one patient was screened but excluded because of a hemoglobin level <9 g/dl at the time of the study. In total, 80 patients from across the spectrum of CKD were enrolled. The study adhered to the principles of the Declaration of Helsinki and was approved by the human research committee at MGH. All patients provided written informed consent. After written informed consent was provided, random, nonfasting serum, plasma, and spot urine samples were collected within the same visit. Samples were stored for <2 h at 5°C until centrifugation. Upon arrival to the laboratory, the blood samples were centrifuged at 3200 rpm in a Beckman Coulter Spintron DLX centrifuge for 9 min, aliquotted, and stored at −80°C for future analysis. Urine samples were shaken, aliquotted, and stored at −80°C. When enrollment was complete, the stored samples underwent a single thaw followed by batched assay of individual biomarkers in the Core Laboratory of the Mallinckrodt General Clinical Research Center at MGH. FGF-23 was measured using a two-site ELISA that detects two epitopes in the carboxyl-terminal portion of FGF-23 (Immutopics, San Clemente, CA) (9). The inter- and intra-assay coefficients of variation (CV) were 7.3 and 5.0%, respectively. The assay, which detects C-terminal fragments in addition to intact FGF-23, has been used in previous studies of CKD patients (17). Calcitriol and 25(OH)D3 levels were measured using a RIA (DiaSorin Inc., Stillwater, MN). The CV for the calcitriol assay at a range of <32.5 pg/ml are <6.5%, and the CV for 25(OH)D3 levels at a range <30 ng/ml are <2.3%. PTH levels were measured using a two-site, second-generation ELISA that detects intact PTH (Immutopics) (21). The inter- and intra-assay CV were 7.7 and 3.2%, respectively. Serum creatinine, calcium, phosphate, and urine creatinine and phosphate were measured using standard assays. eGFR was calculated using the modified Modification of Diet in Renal Disease equation (22). The fractional excretion of phosphate (FePO4), which standardizes phosphate excretion for differences in overall urine concentration and the contemporaneous serum phosphate, was the primary measure of renal phosphate handling (23). For this study, FePO4 was the preferred measure of renal phosphate handling rather than the renal threshold of phosphate reabsorption standardized to GFR (TmPi/GFR) because the TmPi/GFR is validated for use in fasting individuals (23) and no patients were instructed to fast before the blood and urine sampling. 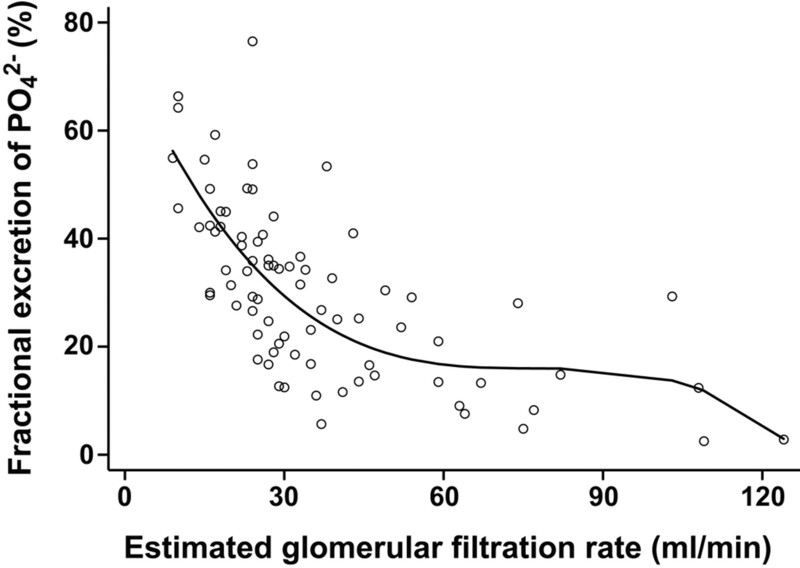 Severity of renal dysfunction was examined on a linear scale using the eGFR and also categorically using a modified National Kidney Foundation (NKF) staging system that has been previously reported (24): Group 1, eGFR >60 ml/min per 1.73 m2; group 2, eGFR 45 to 60 ml/min per 1.73 m2; group 3, eGFR 30 to 45 ml/min per 1.73 m2; and group 4, eGFR <30 ml/min per 1.73 m2. Simple and multiple linear regression analyses were used to examine the associations between FGF-23, calcitriol, phosphate, calcium, PTH, and eGFR. Nonnormally distributed analytes, including FGF-23, PTH, and calcitriol, were log-transformed to achieve normality for the regression analyses. Squared and cubic polynomial terms were included in the bivariate and multivariate models when appropriate to account for exponential relationships between individual biomarkers and the dependent variables. Multiple linear regression was used to test the association between FGF-23 and the FePO4, adjusting for PTH levels, and to test for an inverse association between FGF-23 and calcitriol levels, adjusting for 25(OH)D3 levels, serum phosphate, and eGFR. All analyses were performed using Stata Intercooled 7.0 statistical package (Stata Corp., College Station, TX). Two-sided P < 0.05 was considered statistically significant. In addition to P values, we report t scores for individual parameters from the linear regression models to quantify the strength of associations. Demographic and clinical data of the study cohort are presented in Table 1. Two patients were taking 1200 IU/d oral vitamin D, and no others were being treated with supraphysiologic doses of vitamin D. Eight patients were receiving calcium supplementation, and the maximum dose of elemental calcium being administered was 1500 mg/d in one patient. All others received <1000 mg/d. Patients were divided into four CKD groups according to the eGFR. The total number of patients within the CKD groups and their mean eGFR and mean biochemical parameters are summarized in Table 2. Four patients with preserved eGFR (>100 ml/min per 1.73 m2) were considered to have CKD on the basis of persistent hematuria and/or proteinuria and biopsy-proven minimal-change disease in two, membranoproliferative glomerulonephritis in the third, and IgA nephropathy in the fourth. There was a statistically significant linear increase in levels of FGF-23 across the four CKD groups (Figure 1). Serum phosphate and calcium levels, expressed as a function of eGFR, are presented in Figure 2. Hyperphosphatemia (>4.6 mg/dl) and hypocalcemia (<8.5 mg/dl) were present in 12 and 6% of patients, respectively, all of whose eGFR was <30 (Figure 2). Indeed, only group 4 demonstrated a statistically significant increase in serum phosphate levels relative to group 1 (P < 0.01), and even within group 4, most patients had normal serum phosphate levels. Although there was a significant decrease in serum calcium levels in groups 3 and 4 compared with group 1 (P = 0.02), there was no difference in calcium levels among groups 2, 3, and 4. In contrast to the relatively flat serum phosphate curve among early-stage CKD patients, there was an exponential inverse association between FePO4 and eGFR that was most notable among patients with eGFR <60 ml/min per 1.73 m2 (P < 0.01; Figure 3). The increase in FePO4 was statistically significant in all paired group comparisons (P < 0.05) except group 2 versus group 3. Thus, it seems that compensatory increases in renal phosphate excretion are recruited in early-stage CKD before the development of hyperphosphatemia. Distributions of plasma fibroblast growth factor-23 (FGF-23) levels within the four renal function groups. Boxes represent the interquartile range with the upper and lower edges representing the 75th and 25th percentiles, respectively. The central horizontal lines represent the median levels. The vertical whiskers above and below the boxes represent the range of outliers up to 1.5 times the interquartile range. Circles beyond the whiskers represent severe outliers. Serum phosphate (R2 = 0.31; P < 0.001; A) and serum calcium (R2 = 0.10; P < 0.01; B) according to estimated GFR (eGFR). Shaded areas reflect the normal ranges of 2.5 to 4.6 mg/dl for phosphate and 8.5 to 10.0 mg/dl for calcium. Relationship between fractional excretion of phosphate and eGFR (R2 = 0.51; P < 0.001). As shown in Figure 4, there was an exponential, inverse correlation between log FGF-23 levels and eGFR (P < 0.01) and between log immunoreactive PTH (iPTH) levels and eGFR (P < 0.01). As shown in Table 3, both increased FGF-23 and iPTH were associated with increased serum phosphate in bivariate analyses, whereas in multivariate analyses, FGF-23 but not iPTH was independently associated with serum phosphate. In contrast, as shown in Table 4, FGF-23 and iPTH were each significantly associated with FePO4 in both bivariate and multivariate analyses. Increases in serum phosphate were linearly associated with increased FePO4 in bivariate analyses, but this association was completely extinguished when adjusted for either FGF-23 or iPTH, suggesting that augmentation of urinary phosphate excretion by hyperphosphatemia is mediated via increased FGF-23 and PTH. Along with PTH and FGF-23, eGFR was the only other independent predictor of FePO4 in the multivariable analysis, suggesting the possibility that additional unmeasured phosphaturic factors associated with declining renal function may contribute to augmented phosphate excretion. Log FGF-23 (R2 = 0.44; P < 0.001; A) and log parathyroid hormone (PTH; R2 = 0.45; P < 0.001; B) according to eGFR. Seventy-five percent of patients demonstrated a modest degree of vitamin D deficiency marked by 25(OH)D3 levels of 10 to 30 ng/ml. Severe deficiency (<10 ng/ml) was present in another 5%. As expected, there was no association between 25(OH)D3 levels and renal function because its synthesis is independent of kidney function. 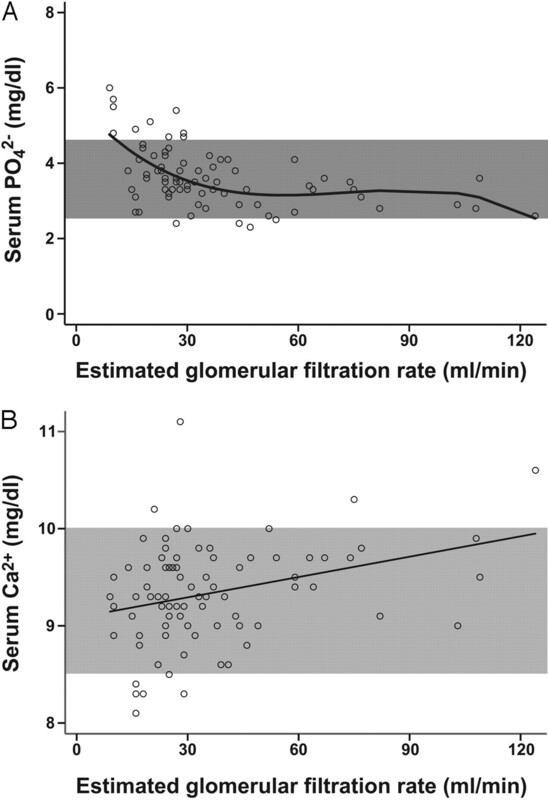 In contrast (Figure 5), serum calcitriol levels decreased linearly across the spectrum of CKD (P < 0.01), with statistically significant reductions evident in groups 3 and 4 versus group 1 (P < 0.02). Table 5 demonstrates factors associated with calcitriol levels. In bivariate analyses, increased serum phosphate, PTH, and FGF-23 and decreased serum calcium, 25(OH)D3, and eGFR were each significantly associated with decreased calcitriol levels (P < 0.01 for each); on the basis of the regression t scores, FGF-23 was the strongest univariate predictor. Adjusting for 25(OH)D3 levels did not alter the association between deteriorating renal function and decreasing calcitriol levels. Interestingly, adjusting for FGF-23 completely extinguished the association between renal function and calcitriol levels and between hyperphosphatemia and calcitriol levels. When all of the variables that were associated with calcitriol in bivariate analyses were included together in a multivariate model (Table 5), only FGF-23 and 25(OH)D3 levels were independently associated. In the multivariate analysis, FGF-23 again was the strongest determinant of calcitriol levels, independent of renal function, serum phosphate, and vitamin D stores. Calcitriol levels according to eGFR (R2 = 0.33; P < 0.001). To assess further the strength of the associations among early- and late-stage CKD patients, we reexamined the primary analyses after stratifying patients into early (groups 1, 2, and 3; n = 37) and late (group 4; n = 43) CKD groups. FGF-23 was significantly associated with the serum phosphate and FePO4 in the late CKD group but not in the early group, which was not unexpected given that the serum phosphate and FePO4 curves were mostly flat until eGFR decreased to less than approximately 60 ml/min per 1.73 m2. In contrast, in both the early and late CKD groups, increased FGF-23 was independently associated with decreased calcitriol levels (data not shown) despite the reduction in statistical power owing to reducing the sample sizes for the individual analyses. The inverse association between FGF-23 and calcitriol in the early CKD group remained independent of eGFR, supporting our hypothesis that inhibition of renal 1α-hydroxylase activity by FGF-23 may be more important than loss of renal mass, even in early-stage CKD. Finally, as shown in Table 1, seven patients were treated with phosphate binders, all of whom had an eGFR ≤35. Excluding these patients did not alter any of the independent associations between increased FGF-23 and decreased eGFR, increased serum phosphate, increased FePO4, or decreased calcitriol (data not shown). Anemia is a common complication of CKD that develops as a result of comorbid conditions or the progressive decline in renal erythropoietin secretion associated with the loss of kidney mass itself (25). Therefore, to assess further whether insufficient renal mass is a viable explanation for the calcitriol deficiency associated with progressive CKD, we compared the prevalence and timing of anemia relative to calcitriol deficiency. For this analysis, patients were defined as anemic when their hemoglobin concentration was <11.0 g/dl or when they were being treated with erythropoietin replacement therapy. Calcitriol deficiency was defined by a serum level <30 pg/ml (26). As displayed in Figure 6, the prevalence of calcitriol deficiency was greater than the prevalence of anemia in all renal function groups. The results were qualitatively unchanged when a hemoglobin of 12 was used to liberalize the definition of anemia and when patients with 25(OH)D3 levels <20 were excluded from the analysis (data not shown). Relative prevalence of calcitriol deficiency and anemia within the four renal function groups. In this cross-sectional study of 80 patients from across the spectrum of CKD, increased FGF-23 levels were significantly associated with deteriorating renal function and with decreased calcitriol levels. Importantly, whereas hyperphosphatemia was observed only with advanced renal disease, there was a significant increase in FGF-23 levels in earlier stage CKD. Although the stimulus for increased FGF-23 secretion in the absence of hyperphosphatemia remains unclear, increased serum phosphate was associated with increased FGF-23, which in turn was an independent predictor of increased FePO4. Thus, it seems that during early stages of CKD, FGF-23 may contribute to maintaining the serum phosphate level within the normal range. 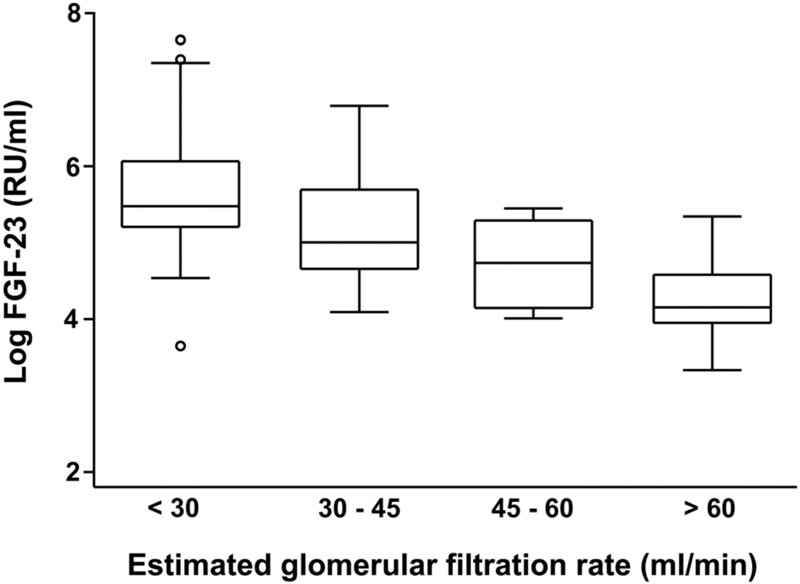 This compensation for decreased nephron mass may be overcome by severe renal failure when overt hyperphosphatemia develops despite markedly increased FGF-23 and FePO4 levels. These data extend the results of previous studies that suggested that FGF-23 increases with decreasing GFR and is associated with augmented phosphaturia. Furthermore, increased FGF-23 was the strongest independent predictor of decreased calcitriol levels. This association was independent of 25(OH)D3 stores, serum phosphate levels, and the degree of renal dysfunction, suggesting that functional inhibition of 1α-hydroxylase by FGF-23 is a more significant determinant of calcitriol levels than hyperphosphatemia and even renal function itself. We propose that increased FGF-23 levels in CKD may help maintain normal serum phosphate levels but at the cost of suppressing calcitriol levels and worsening SHPT because of decreased feedback inhibition by calcitriol. Thus, we speculate that FGF-23 may be a central mediator in the early pathogenesis of SHPT in CKD. FGF-23 is a 251–amino acid protein with an amino-terminal portion that is well conserved across species and a less conserved carboxyl-terminal domain (12,27,28). The full-length, biologically active hormone is cleaved at its RXXR motif into presumably inactive amino and carboxyl-terminal fragments by a subtilisin-type proprotein convertase (12,27,28). It is most likely secreted from bone-forming osteoblasts in adults (27) and by several other tissues during fetal development (29). The central role of FGF-23 in the pathogenesis of XLH, ADHR, and TIO, rare rachitic disorders of hypophosphatemia, inappropriate urinary phosphate wasting, and inappropriately low calcitriol levels (9–11), suggested that FGF-23 may also be a mediator of phosphate homeostasis under normal conditions and in CKD. Indeed, intravenous or intraperitoneal infusion of recombinant FGF-23 in mice induces phosphaturia and hypophosphatemia (30,31), and transgenic mice expressing FGF-23 under the control of different promoters develop hypophosphatemia and rickets (32–34). In contrast, FGF-23 gene-ablated mice develop hyperphosphatemia and excessive calcitriol levels (29,35). The stimulus for increased FGF-23 secretion seems to be phosphate loading (14,36), although the location and function of a putative phosphate sensor and the sensor linked to FGF-23 secretion remain unknown. Nevertheless, FGF-23 suppresses Na+-dependent phosphate uptake by inhibiting the expression of the types IIa and IIc sodium-dependent phosphate co-transporters (Na/Pi-2a and -2c) in the brush border of proximal tubules (15,30,34,37). Importantly, PTH induces phosphaturia by downregulating Na/Pi-2a and -2c transporters in the proximal tubule by decreasing mRNA transcription and increasing endocytosis and subsequent catabolism of previously synthesized transporters from the luminal membrane (37). Therefore, when studying the phosphaturic effect of FGF-23, it is critical to consider the role of PTH. Although studies of thyroparathyroidectomized animals demonstrate that the phosphaturic effects of FGF-23 are independent of PTH (15,36), few previous human studies have aimed to isolate the effects of FGF-23 from those of PTH. In a study of patients with chronic hypoparathyroidism, although plasma FGF-23 levels were increased compared with normal control subjects (38), the patients remained hyperphosphatemic, leading the authors to conclude that in the absence of PTH, FGF-23 itself is insufficient to maintain normal serum phosphate levels. However, indices of urinary phosphate excretion were not analyzed, an important limitation in this hypoparathyroid cohort that required concomitant treatment with activated vitamin D. Thus, it is unclear from this study whether the phosphaturic effect of FGF-23 was truly attenuated or rather masked by excessive gut phosphate absorption. In a subsequent study of 62 CKD patients (18), FGF-23 levels were inversely correlated with the maximum tubular reabsorptive rate of phosphate, suggesting that FGF-23 does play a role in maintaining phosphate homeostasis in CKD. However, importantly, the authors did not account for the potential confounding by PTH. In this study, both increased PTH and FGF-23 were independently associated with increased FePO4, whereas only FGF-23 was independently associated with serum phosphate levels. We conclude from these data and from previous animal studies that the phosphaturic effects of FGF-23 are PTH independent. Furthermore, in patients with CKD, increased FGF-23 and increased PTH may act synergistically, a hypothesis that is biologically plausible given the differential cellular effects of FGF-23 and PTH on Na/Pi-2a and -2c (30,37). Calcitriol deficiency is a common complication of CKD. A prevalent explanation for low calcitriol levels in CKD is that with insufficient renal mass, there is decreased renal 1α-hydroxylase activity imposing a block in the vitamin D synthetic pathway. However, the results of this study, which corroborate data from previous studies (6,8), suggest that significant reductions in calcitriol levels occur early in CKD. Indeed, we have shown that reductions in serum calcitriol to subnormal levels occur with greater frequency and earlier in the course of CKD than the development of anemia, another endocrine complication of CKD that is thought to reflect insufficient renal mass. Thus, it seems that calcitriol deficiency is frequently present at a time when there is sufficient renal mass to preserve erythropoietin secretion in most patients. Likewise, other important factors, such as hyperphosphatemia, uremia, and acidosis (7,39), are mostly features of terminal renal failure and thus cannot fully explain calcitriol deficiency during early-stage CKD. The results of this study suggest that an early increase in plasma FGF-23 likely plays a central role in the early and progressive development of calcitriol deficiency in CKD. Indeed, when we included FGF-23 in the multivariate analysis of predictors of calcitriol levels, the significant associations between calcitriol and both renal function and hyperphosphatemia that were observed in bivariate analyses were completely abrogated. Furthermore, a significant independent inverse association between FGF-23 and calcitriol was detectable in the analysis that was restricted to patients with eGFR >30 ml/min per 1.73 m2. These results are supported by animal and in vitro studies, which demonstrate that FGF-23 directly inhibits renal 1α-hydroxylase (30,36). It is interesting that the suppression of 1α-hydroxylase by FGF-23 seems to override the stimulatory effect of PTH as observed in this study and a study of mice that were engineered to overexpress both FGF-23 and PTH (32). A previous human study of CKD patients demonstrated a similar inverse association between FGF-23 and calcitriol levels (18); however, the authors did not adjust for concomitant 25(OH)D3 levels. Adjusting for 25(OH)D3 levels is critical because deficiency is common in the general population (40) and in CKD patients specifically (19). With generic vitamin D deficiency, there is reduced substrate for 1α-hydroxylase, which would magnify the reduction in calcitriol levels in CKD patients and thus provide an additional viable explanation for calcitriol deficiency in early CKD. Importantly, in this study, the strong inverse association between FGF-23 and calcitriol remained significant after adjusting for 25(OH)D3 stores, which itself remained an independent predictor of calcitriol levels. The latter provides support for the NKF Kidney Disease Outcomes Quality Initiative guideline to supplement vitamin D in CKD patients with subnormal 25(OH)D3 levels (41). We acknowledge several limitations of this study. First, the cross-sectional design limited our ability to examine longitudinal changes in FGF-23, calcitriol, PTH, and mineral levels in individual patients over time as renal disease progressed; thus, we cannot infer causality or the direction of the associations that we identified. However, we have attempted to limit our interpretation of the data and the potential directions of associations within the context of the published literature regarding the relevant renal and mineral physiology along with emerging data about FGF-23. A second limitation is that we were unable to instruct any of the patients to fast before collecting serum or urine samples; thus, instead of being able to calculate the TmPi/GFR, we were forced to examine FePO4 as the measure of renal phosphate handling. This limitation introduced the possibility that dietary variability influenced the results. However, the effect of not standardizing intake would be to bias our results toward the null hypothesis of observing no associations when they truly exist. That we nonetheless observed significant results for each of the hypotheses tested despite the lack of standardization further bolsters our results. Third, the assay that we used to measure FGF-23 levels detects both the intact, biologically active molecule and the inactive C-peptide fragments, which may accumulate as renal function declines. Although accumulation of inactive fragments may have increased in advanced CKD, these assays have been used in previously published studies of CKD patients (17). Furthermore, imprecision in assays would be expected to increase variability and thus bias the results toward the null hypothesis rather than toward the significant findings that we observed. Finally, a primary aim of this study was to test the hypothesis that the phosphaturic effects of FGF-23 are independent of PTH in an in vivo human model of CKD. This aim was examined using statistical techniques, which provided significant results. Nonetheless, it would be preferable in the future to test this hypothesis in longitudinal studies and perhaps in a human parathyroidectomy model, such as CKD patients who are treated with cinacalcet, when potential confounding by PTH could be minimized further. The primary abnormality that triggers the development of SHPT in CKD remains elusive. Some authors have attributed it to the release of PTH from feedback inhibition by falling calcitriol levels because PTH levels begin to rise and calcitriol levels fall long before the emergence of hyperphosphatemia and hypocalcemia (4,6). Our data support this hypothesis. Furthermore, we propose that increased FGF-23 and, to a lesser extent, 25(OH)D3 deficiency, when present, are the primary mechanisms of calcitriol deficiency in CKD. This hypothesis has potentially important therapeutic implications. Hyperphosphatemia is consistently identified as an independent risk factor for mortality among hemodialysis patients (1,2). Accordingly, the NKF Kidney Disease Outcomes Quality Initiative guidelines emphasize phosphate restriction and oral phosphate binder therapy for stage 5 patients (41). However, for stage 3 or 4 patients, these interventions are recommended only when the serum phosphate levels exceed 4.6 mg/dl (41). To the contrary, previous studies demonstrated that dietary phosphate restriction increases calcitriol and decreases PTH levels in early-stage CKD patients with normal serum phosphate levels, despite minimal change in the serum phosphate (6,42). To unify these observations with emerging data, we speculate that decreased phosphate intake may blunt the increase in FGF-23, thereby partially releasing the functional inhibition of 1α-hydroxylase, thus restoring calcitriol levels and ameliorating the development of SHPT. If this hypothesis is verified by longitudinal and interventional studies, then monitoring plasma FGF-23 levels (or FePO4) may provide in early-stage CKD patients a novel tool to guide phosphate restriction therapy that is more sensitive than the serum phosphate level. Future studies are needed to test these hypotheses and to test whether increased calcitriol levels achieved through phosphate restriction alone could have beneficial effects on hard clinical outcomes such as patient survival. Patients with CKD at all stages are at markedly increased risk for mortality (24), and hemodialysis patients who are treated with activated vitamin D preparations demonstrate improved survival (43). Whether this survival benefit could be extended back to earlier stage CKD patients is exciting and worthy of further investigation. This study was supported by a Young Investigator Grant from the National Kidney Foundation (M.W.) and grants K23RR017376 (M.W.) and M01RR01066 (MGH General Clinical Research Center) from the National Center for Research Resources, National Institutes of Health.